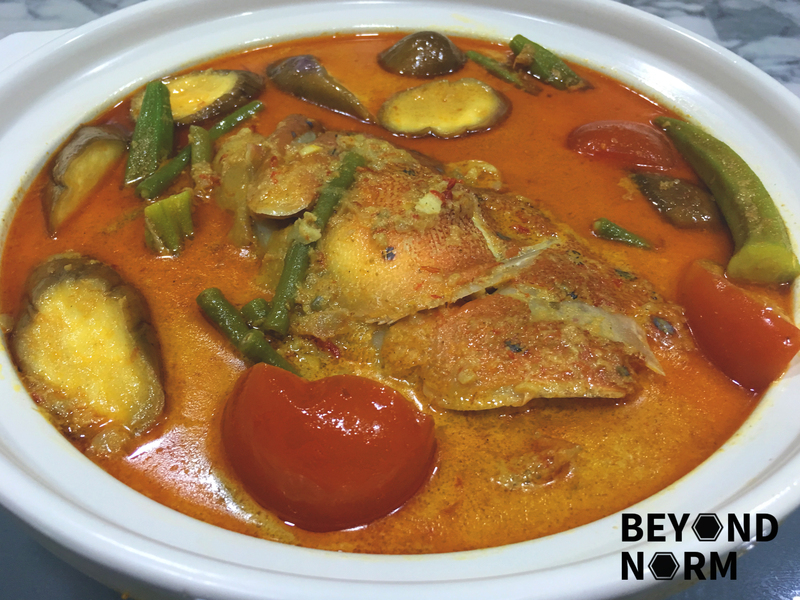 If you ask me if there is any difference between the Singapore and Malaysia Curry Fish Head, I do not think it differs. However, I do prefer the Chinese-style of fish head curry as opposed to the Indian-style when I am eating with white steamy rice. As I am a strong believer that any homemade rempah (spice paste) surpasses those store bought, I made my own from scratch. Any white flaky fish heads are great for this dish but if you are put off by looking at the head you can easy substitute it with fish tail or fish cutlets. Rub some salt over the fish head and set aside for ½ an hour. 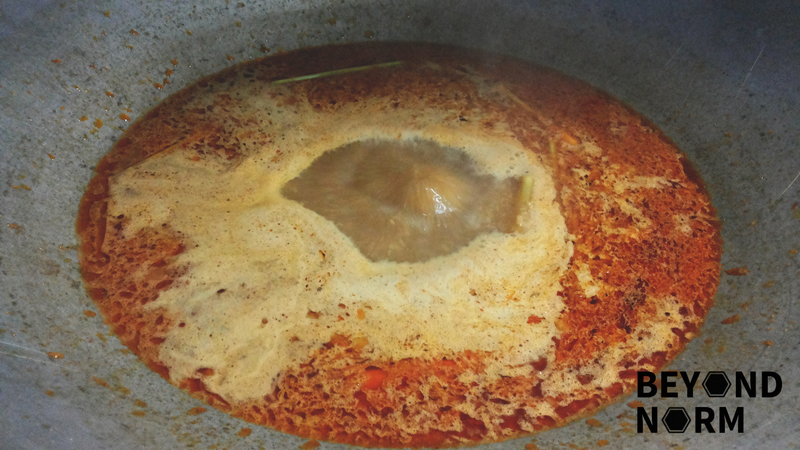 When rinsing off the salt, ensure that all the blood is removed from the fish as it may cause bitterness in the curry. Rinse the okra and cut off the top and the tip and set aside. 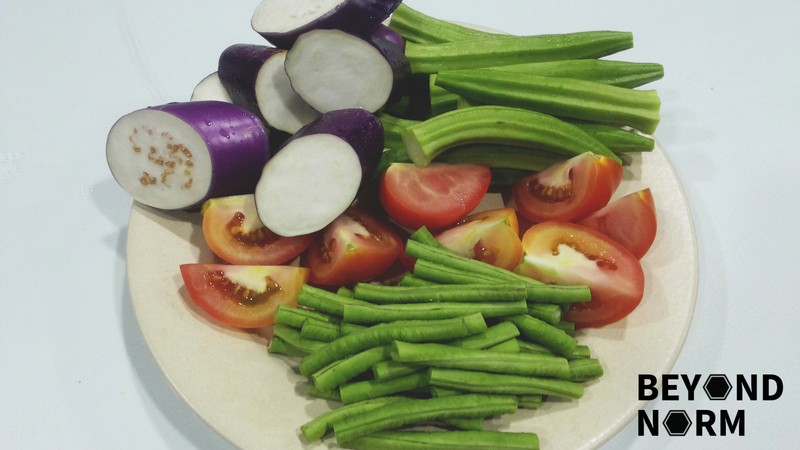 Slice the eggplant diagonally into 1-inch thick and salt the pieces for 10 minutes, then rinse and set aside. Rinse the tomatoes and quarter them, then set aside. Rinse the long beans and cut them into 2 inches long, then set aside. 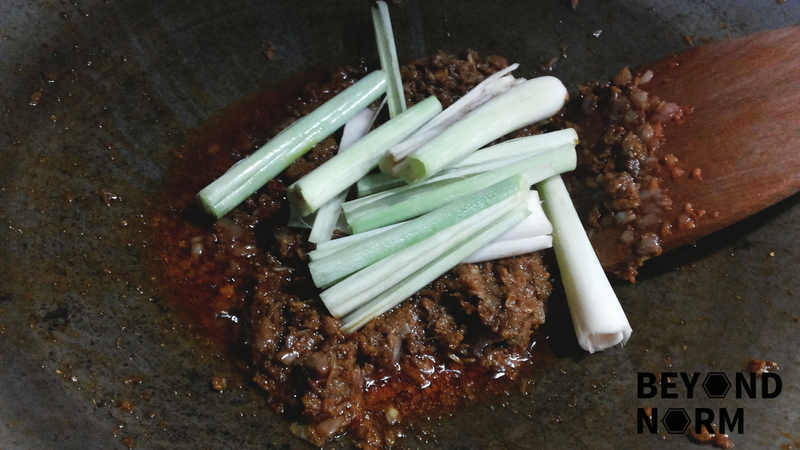 Rinse the lemongrass and cut them into 2 inches long, then bruise them lightly and set aside. Remove seeds from the softened chilli if you do not want your chilli paste to be too spicy, otherwise leave them in the chilli. 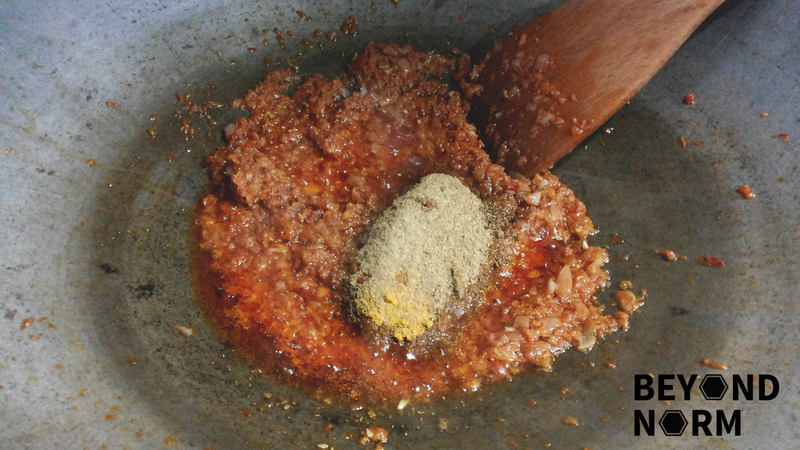 Chop the chilli into smaller pieces and pound/blend into a paste then set aside. Remove skin from galangal and ginger. Slice and roughly chop then add them into the mortar. Heat up a small pan and put the piece of belachan into it and toast till fragrant. Remove and add it into the mortar. Pound galangal and ginger and belachan till fine. Then add in garlic and shallots and pound till fine. Then add chilli and pound till well mixed and set aside. Combine all the curry powder ingredients together in a bowl. Heat up the oil in a large pan/pot. Fry the pounded ingredients for 3-5 minutes. 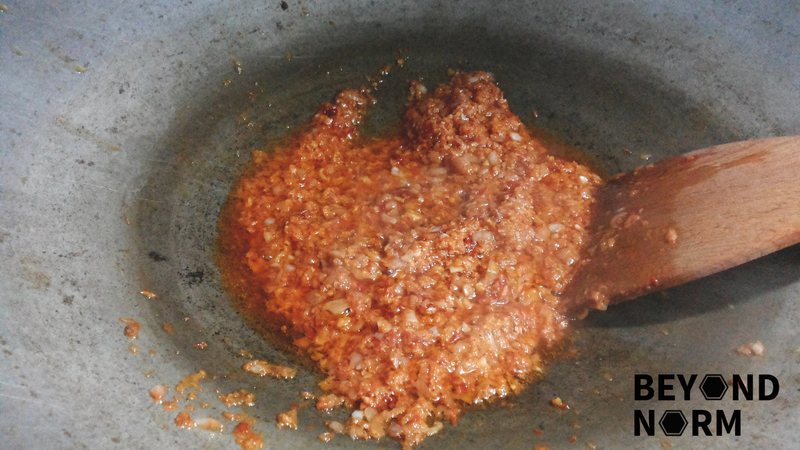 Then add the curry powder mixture and continue frying for 2 minutes until the chilli oil starts to release into the pan. Add water, cover and bring to a boil. Simmer for 1/2 hour. Then add the seasoning and coconut milk. Once it starts to simmer, quickly add the eggplants and tofu puffs (if you are using) and let them simmer for 10 minutes. Add the okra, tomatoes, long beans, and the fish. 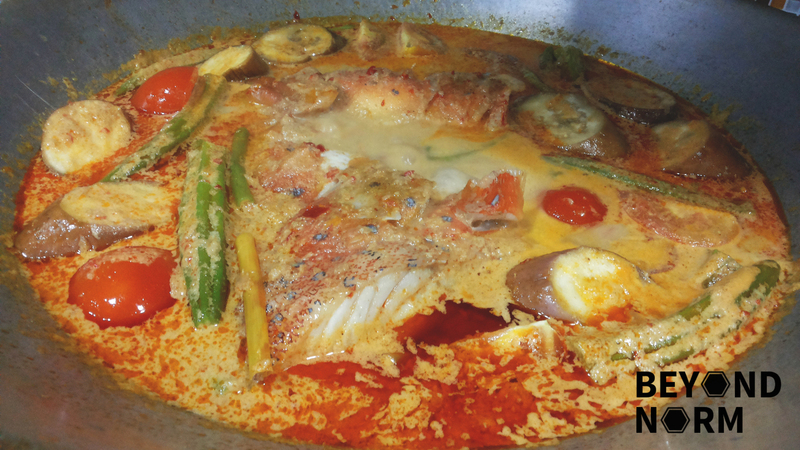 Cover and simmer gently for 10 minutes or more till the fish is cooked. Turn off the heat and let it sit for 2 to 3 minutes so that the oil rises to the top. Dish out into a pot, garnish with coriander (if you are using) and serve immediately with steamed white rice. If possible ask your fishmonger to scale your fish head properly. It’s not pleasant to have fish scales in the curry while you’re eating. An interesting fact I learned was that mixing the curry powder with water will cause the curry to be powdery so take note of this. Yr curry shld b delicous. I scald my fis head in very hot boiling water to remove the left over scales at the fish cheeks. Your fish head curry looks yummy.